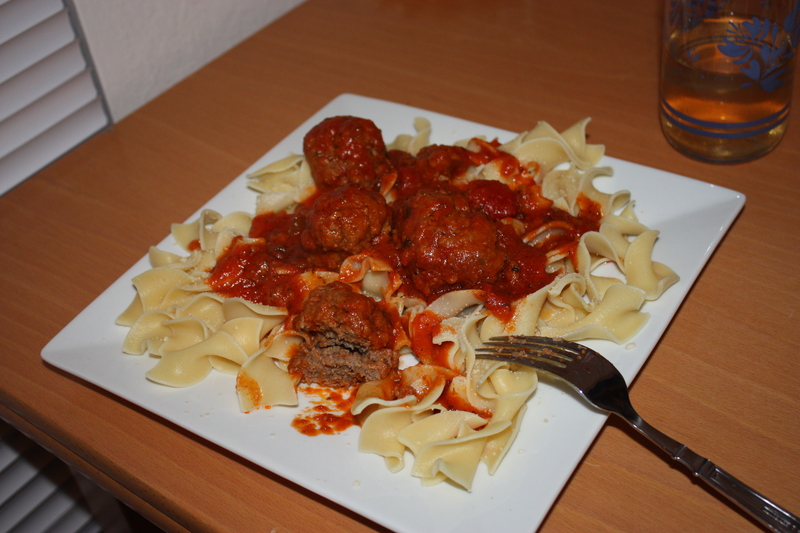 Tefteli are meatballs – a little larger than the typical. You can make them several different ways, with red sauce, broth type sauce, or potato-ey sauce. the list must go on and on, but this is how my mom made it. To prep, peel and cut the potatoes into small strips, about 1 inch thick and 3-4 inches long each. Dice the onion, and form the Tefteli. Form the Tefteli by adding all the above ingredients together and forming 2-3 inch thick balls. To start cooking, brown the onion over medium heat with olive oil. Then, place the Tefteli in the pot with the onions, and brown them a little on both sides. Add the sliced potatoes around the Tefteli and sprinkle with more garlic powder (just enough to put a light coating on top of the food) and cover the entire pot with water just enough that the Tefteli are covered, potatoes mostly covered. Add the bay leaves and cover the pot, simmering for 20 minutes. Grab some bread for dipping and enjoy!!! I will add pictures when I get the chance to make this again. DELICIOUS! 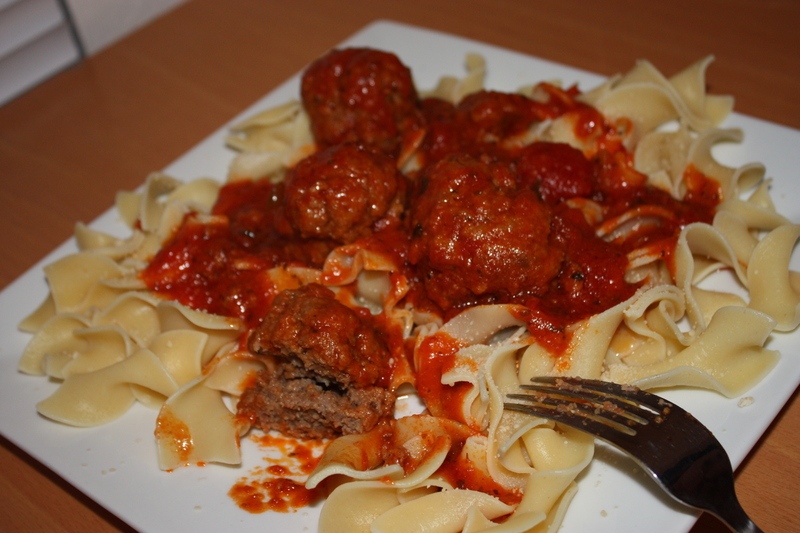 Not sure why i’ve been on a sauce and cheese frenzy… but it just always seems like the right food to fill me up fast! I’ve been so busy with working my refrigerator is frowning at me with emptiness and the last thing in my freezer was ground beeeeeeeef. I decided = meatballs. Spaghetti sauce – to your liking, or make your own! 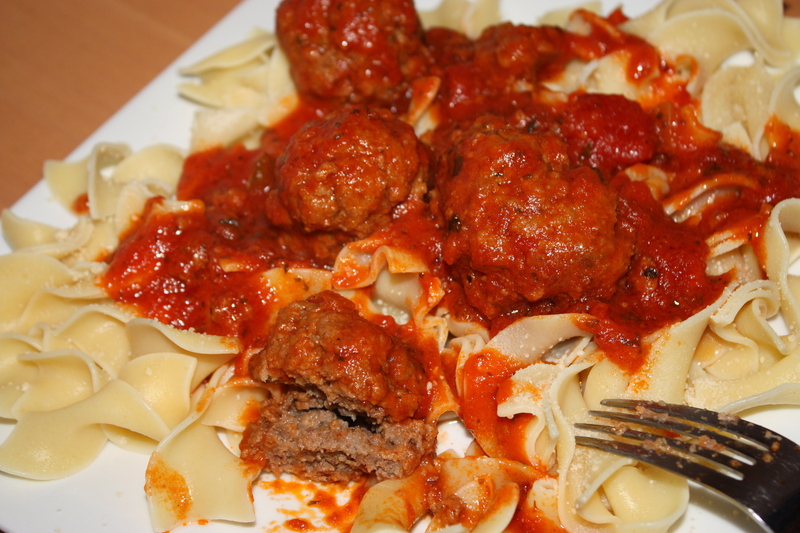 Mix everything together nicely – then form into meatballs (the size of a golf ball). You can use any sauce you’d like with this or make your own – Heat up the sauce on a saucepan, put the balls into the sauce and let them simmer covered for 30 minutes. Serve over your favorite type of pasta and enjoy!